Our large foster network is always open! Fosters provides the home, love and support for rabbits after they are rescued until they find their own forever home. Fosters are loaned set up supplies (pen, litter box, food and water dishes and floor cover) then fosters provide the love and support bunny needs while they wait for permanent homes. We have a description of what its like to be a foster site for The Haven, and a foster site application (PDF and Word) that you can read. Rabbit Haven volunteers are needed at local shelters to help clean bunny cages and habitats, provide food and water to all rabbits, to change the bedding in rooms, and to place rabbits in play zones for play time. Volunteers help the bunnies by loving them, grooming, petting and spending quality time with them while they play. 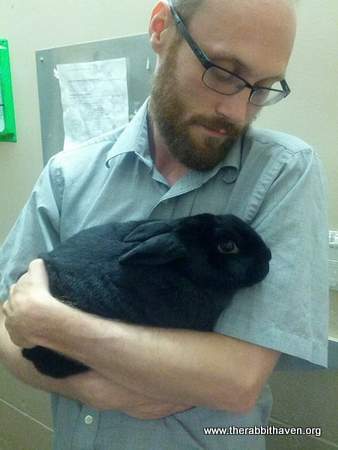 Our shelter volunteers also help identify bunnies that need medical care and alert us about rabbits that need rescue. 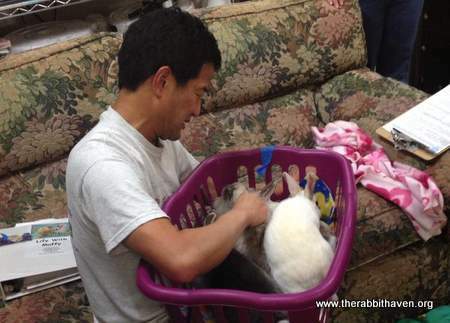 Volunteers shuttle rabbits to veterinary appointments, pick up supplies, and run other errands as needed. Everyone works cooperatively. We have positions open in our Rabbit adoption team as Haven show volunteers! Both Counselor and show support positions are open. Training is provided. When you work at adoption shows as show support or as a counselor you are expected to know a great deal of information about rabbit care, support, housing, medicine, diet and social needs. 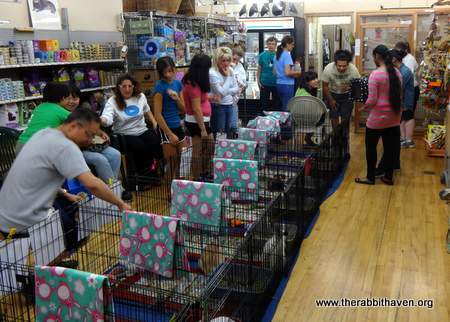 This group of volunteers is central to our success in placing rabbits into loving, permanent, indoor homes. Show set up volunteers attend Haven adoption events and assist with preparation and clean up for the shows. Adoption shows happen every other Sunday at Pet Pals in Soquel and the the first Saturday of the month at For Other Living Things in Sunnyvale. At Soquel shows, set up is 8:30AM to 10AM and at Sunnyvale shows set up is from 9AM to 10:30 AM. Show clean up people come in at the end of the show and break down pens, clean the area and put away pens and special show equipment. Soquel shows end at 5 PM and Sunnyvale shows end at 4 PM. Staff counselors (educators) are trained to engage, educate and involve the public. Counselors help new families complete their adoption paperwork and assist with questions regarding bunny care and set up. 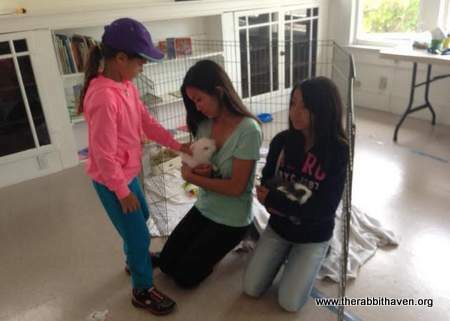 Then the counselors help the family meet and select the right rabbit for their home. You must be 18 years or over to be a show counselor. Assist the public signing into the show area, help get them paperwork or counseling support they need and help them pick up and hold rabbits inside the show area. Show support volunteers keep the show areas pens and flooring neat and clean and make sure all rabbits have food and water and are safe during the shows. Show support staff may also be trained to assist new adopters in shopping for supplies for their rabbits. Haven staff treat people and rabbits with respect and always remain positive, friendly and constructive. The Haven does not discriminate on the basis of color, age, race, religion, gender, handicap or sexual orientation. The Rabbit Haven staff are family friendly. The public may always feel comfortable bringing children to our events. Adoption show counselors are outgoing, always positive, polite, and enjoy public interaction. 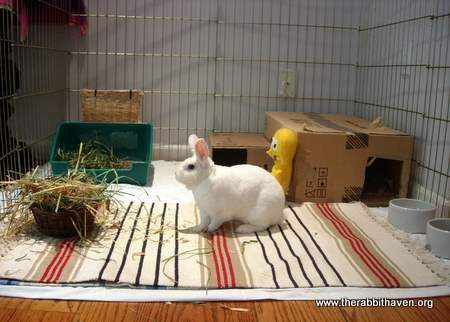 Clients are visiting us to find a rabbit companion to adopt or just be with the rabbits. Our job is to educate every person who attends our shows and to help the bunnies find a new forever home. Haven staff helps the public learn all about the many wonders of house rabbits. Hopefully we can also help make that special connection and an adoption will occur. The Rabbit Haven is known to be the place to come to learn about rabbits. It is a haven for both people who want to learn and rabbits who need shelter and a home. We assist everyone and everybun who comes to us. There are even more fun ways that you can participate. We have many special projects. There is a sewing program (the Haven Bunny Bee), Photography, Petfinder and Adopt A Pet postings, Facebook postings, a children's education program, poster and flyer design projects, holiday craft projects, our holiday gift bag program, and the Bunny Fest festival held at mid year. You can also train to work in nail trims at shows or at shelters or adoption centers. Other volunteer areas include Administrative Assistant positions, database and rabbit intake software input, QuickBooks, rabbit intake staff, rabbit rescue teams, and IT work. We also have positions in media preparation and outreach for Eventful, newspapers, and Yahoo! groups. We can also use help with language translation, marketing, education campaigns, retail support, and social media. There are also two positions open for videographers. You can fit into our system in so many ways. Everyone can be involved. We are looking for people who want to make a difference in animal welfare and who are interested in joining with a community group devoted to rabbit rescue, care, support and placement. 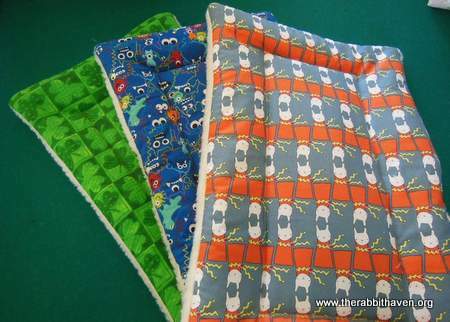 Lend your skills and join in the fun of caring for little bunnies. We need coverage 7 days a week. So call us today and see what you can do. Students, we can provide you continuing education units if it is part of your plan with your school. Ask your school counselor. We do accept people 14 years of age and up and we do need guardian or parent permission. We work with scout troops on special silver and bronze assignments. Mentoring programs also available.